I mostly spent this past weekend catching up on laundry and mail and other stuff around the house, but I did make time to go to quilt guild on Saturday, which was a bit annoying because the membership cards hadn’t been mailed out ahead of time so check-in took extra long and the blueberry growers or someone had our regular space which meant we were in a different room which had an annoying buzz in the speakers and poor sightlines for much of the audience but I did get to see some quilts and that’s never a bad thing. 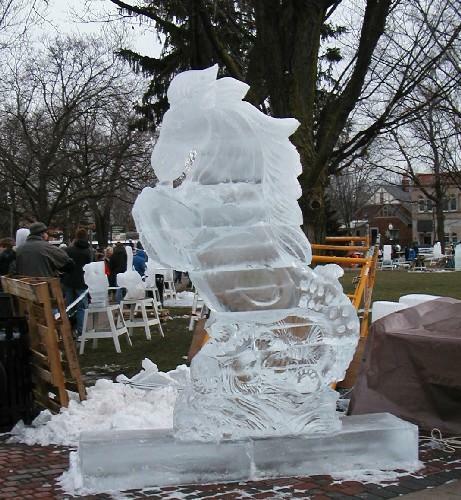 Then yesterday Mr. Karen and I went to an ice sculpture festival. It’s been pretty warm for January, so I thought everything might be melted, but we went anyway because we haven’t had many chances to go in recent years, as they usually hold it the weekend we’re off skiing (possibly they are in cahoots with the woman who tries very hard to schedule our holiday office party when I’m out of town). So we went and yes, some things were melted and broken, like the one-eared, one-armed Pikachu in the cartoon characters section, and many were opaque–this was the best I’d ever seen my bank’s logo look, hidden behind layers of cloudy ice–but most of the pieces were still standing and recognizable, and there were a few things that were recently done and still clear and shiny. In addition to the ice sculptures, there were a lot of dogs to look at–big dogs and small dogs and fluffy ones and ones wearing sweaters. We saw a dog wearing a coat and eating a corn dog on a stick held by his owner. We saw a mastiff puppy. We saw a Scottish terrier wearing a tartan collar. I ended up having a good time and taking lots of pictures (of the ice, not the dogs, because the former were easier to capture, as they were not prone to moving out of the frame just before the shutter snapped).